Unknown Prague: Hrdlorezy - "Cutthroat village"
Czech sense of humor - in the Czech board you can read following words: "There used to stay a house on this place since the 17th century. The house was memorable by the fact that there is never anything special happened. May the Czech history continue to avoid this place." 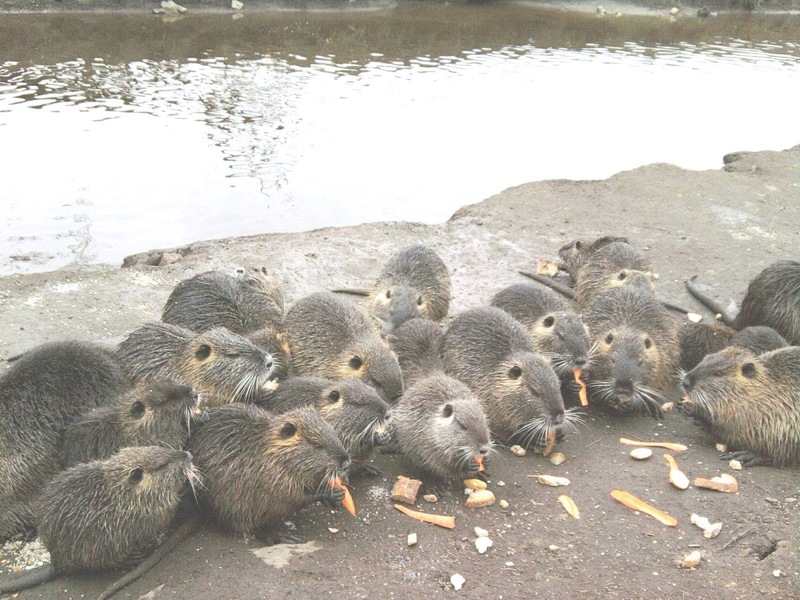 Nutrias live in good harmony with the wild ducks which eat all what the nutrias left. 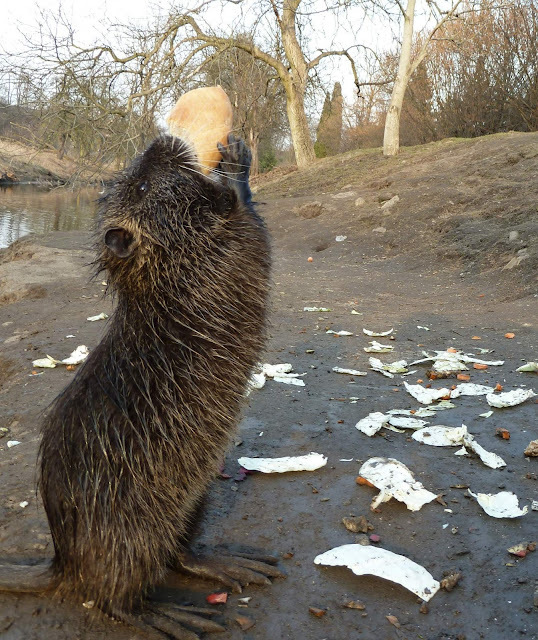 However, mostly it is not much left, so the dugs are sometimes courageously trying to tear out the bread directly from nutrias hands. Nutrias battle among each other for food and small cubs are not afraid to pick up a piece of food "straight from the mouth" from the old and bold individuals. The young ones are mostly surprisingly successful. 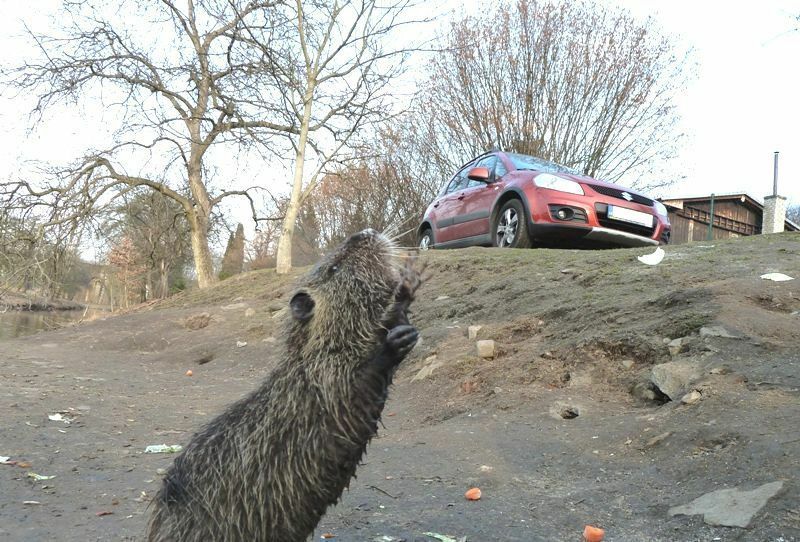 The reason is that the nutrias are not able to see well and see only the bread just before their nose. Cubs, when they battle for bread, are more nimble and take it as a game. Individuals, who wish to have a meal at rest, take it away to the other side of the small river named Rokytka nearby their burrows, where they are happily eating and washing. The burrows are built just above the surface of the water and are not very deep. Happy end: good message for all of the nutrias lovers - in July 2013 they are back again !!!!!!!!!!!!!!!! Are we in Prague or in the idyllic countryside? Many makeshift colonies with small makeshift houses made ​​up of all sorts of building materials arised on the outskirts of Prague during the 1920th a 1930th. The trio of colonies "In front ofthe Bridge" (in Hrdlorezy), "Behind the Bridge" (former in Hrdlorezy today in Hloubetin) and "Behind the Mountain" (in Hloubetin) was closely linked to each other. All houses in the colony, which is really "In front of the bridge", are already upgraded, some newly built and provide a beautiful home in the countryside near the Rokytka river and yet in Prague. We are "in front of the bridge"
Some nice people have even found the original number of their house- in English: "Makeshift building, 24, Colony In front of the Bridge, Cutthroat village"
Pub "U Brezanky" hidden in the countryside at Rokytka river refreshes both members of the club Spartak Hrdlořezy and wide (not just sport) public, such as mothers with children who can use a children's playground. The pub has an outdoor terrace with barbecue. Nearby is an outdoor fireplace.